How to move to Canada from Saudi Arabia ? 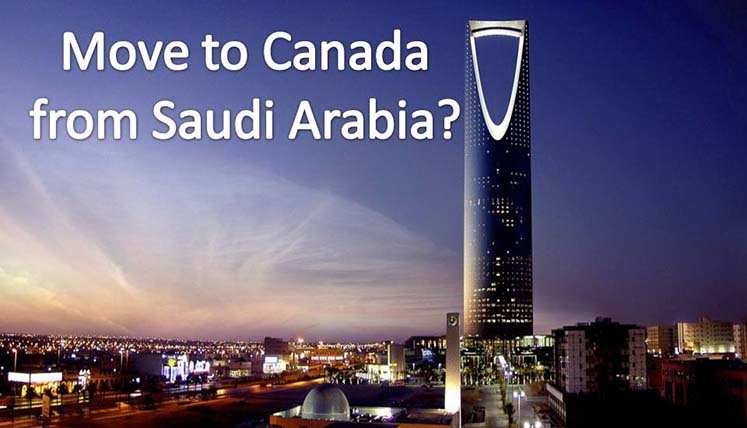 Looking to get permanent residency in Canada from Saudi Arabia? Well, if you are living in Saudi Arabia since long, you must be asking questions to yourself as to how good it would be to move to Canada from Saudi Arabia. How to move to Canada from Saudi Arabia? The Saudi Arabia is a wonderful country to live if you come from relatively conservative society and are quite used to with the laws and customs in Saudi Arabia. However, if you are from a democratic or western country, adjusting in SA environment can be a big challenge for you. There is whole lot of difference in the culture and customs of Saudi Arabia and any liberal country from east or west, especially in terms of socializing, dressing, democratic rights, women rights, etc. Canada on the other is the more of liberal country with well defined social and democratic rights of the people protected under Canadian Law. Canada welcomes and respects the people and communities of different culture, religion, ethnicity, nationality, race, and identity. It’s also a wonderful country to immigrate to with its soft immigration policies, social security benefits, high living standard, plenty of job opportunities, and tremendous infrastructure. Express Entry System: Express entry is the most popular immigration program of Canada. It’s a point based system that offers permanent residency to the candidates that are able to achieve the qualifying marks in any of the fortnightly draws of express entry. QSWP: The Quebec Skilled Worker Program (QSWP) is the immigration program of Quebec province in Canada. It’s a point based program that issues the CSQ (Quebec Selection Certificate) to the selected candidates. The CSQ makes you eligible to apply for permanent residency visa in Canada. PNP: The Provincial Nominee Programs (PNPs) are the separate immigration programs of the each province in Canada that operate in coordination with the federal government in Canada. It follows a point based selection system and provides nomination certificate to the selected applicants, which in turn makes them eligible to apply for PR visa in Canada to IRCC. How to get vital support to apply for Canadian PR Visa from Saudi Arabia? If you are living in Saudi Arabia and want to settle in Canada, you can follow the online immigration system to go for the same. If you seek assistance and support in this regard, you may contact Visas Avenue immigration– A reliable immigration consultancy company for Canada immigration. The certified immigration experts at Visas Avenue have got years of experience in Canadian immigration programs to help you best way in hassle free immigration to Canada from Saudi Arabia. Call the qualified immigration experts at Visas Avenue on contact nos. 011-48447777 (Delhi) or 080-46668222 (Bangalore). Apart from this, you can also mail your queries or enquiries with regards to Canada immigration at Visas Avenue email id- info@visasavenue.com. How easy is it to get PR in Canada? Is it as good as Canadian Citizenship?